When I started cooking healthier, I realized that having sofrito always on hand was a good way to start almost any dish. The flavors from the fragrant onions, peppers and garlic combination is now something I keep in my refrigerator at all times. It started slowly but these days I’m in the habit of making a big batch of traditional Cuban sofrito, then storing it in my fridge for the next few months. I think mami would be proud. The first thing, of course, is the onions. You can use white onions or yellow onions, it doesn’t matter too much. I typically use yellow onions because I prefer the flavor. My mom taught me to make sofrito using green bell peppers. When I asked her why, she said it’s because they are typically cheaper to buy. These days I use them almost completely out of habit. Occasionally I make sofrito with red bell peppers but this time I wanted to try something different. I mean, aren’t they just pretty? This is how the sofrito looks when it’s done. 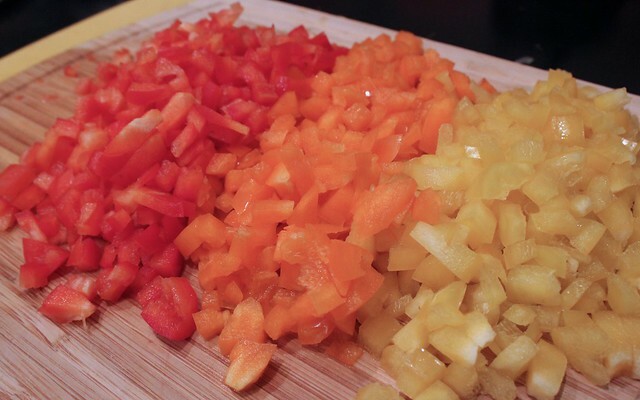 If you’re making a regular batch, you would use only one onion and one bell pepper. Since I’m making a big batch here, though, you’ll see that there is a lot more in this recipe. Oh, and you could probably add more garlic. 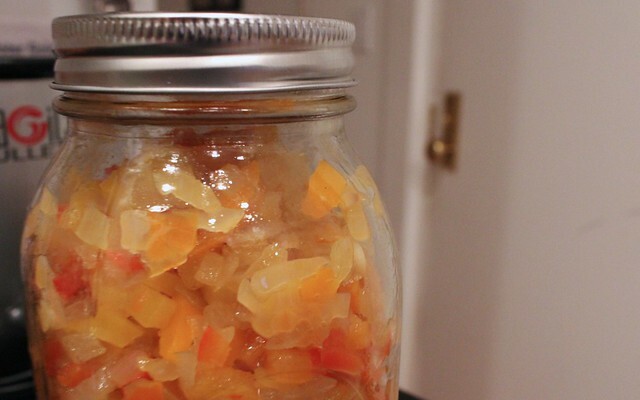 Sure, it would taste the same if your bell peppers were just one color but this batch is just too pretty with the combination of yellow, orange and red peppers. Okay, I’m ready to share the recipe with you now–but I do have to add in one more little bit. As much as I can, I try to buy organic. Truth be told, it’s definitely not a requirement if your family can’t afford it. However, choosing organic means less pesticides in your food and, according to some studies, more nutrients. Even if the science is still mixed, I try to err on the side of caution and go for the better stuff as much as possible. Alright, the mini-lecture is over. On to the traditional Cuban sofrito recipe! 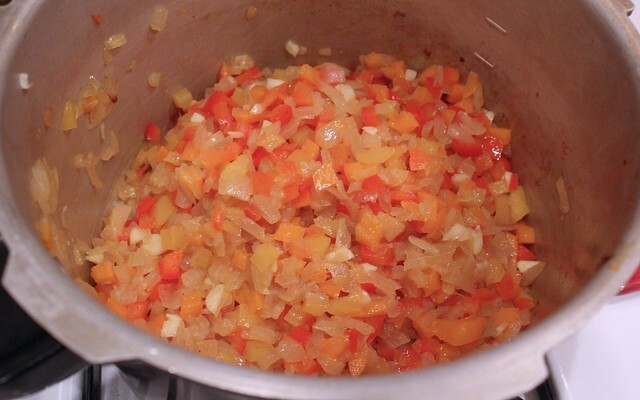 A traditional Cuban sofrito consists simply of onions, bell peppers and garlic. You can use any color of pepper, though typically we use green bell peppers to make this base starter. In a large saucepan, turn heat to high and add the olive oil. Once pan is heated, add in the chopped onions. 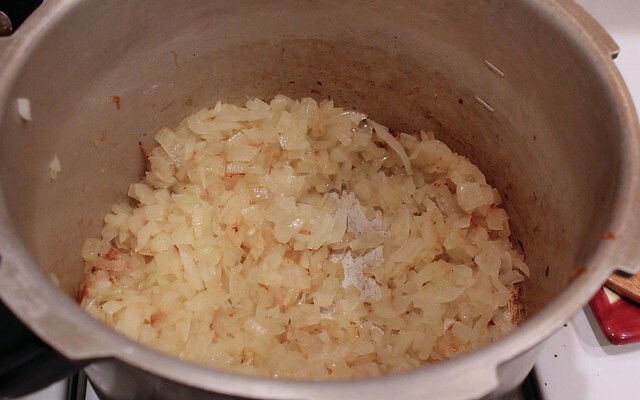 Stir them continuously as they cook until the onions have started to sweat, about 10 minutes. Add in the bell peppers and cook until they have begun to soften, about 5 minutes. Finally, add in the minced garlic. Allow to cook for another 5 minutes, stirring occasionally, until the mixture is done. 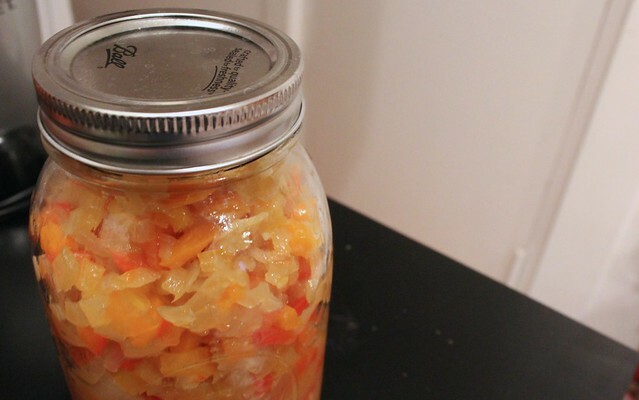 To store, package the sofrito in tupperware or jars. You can freeze half of it, which keeps for about 4-6 months, and use it as needed to begin your dishes. Do you ever make a traditional recipe in a big batch? 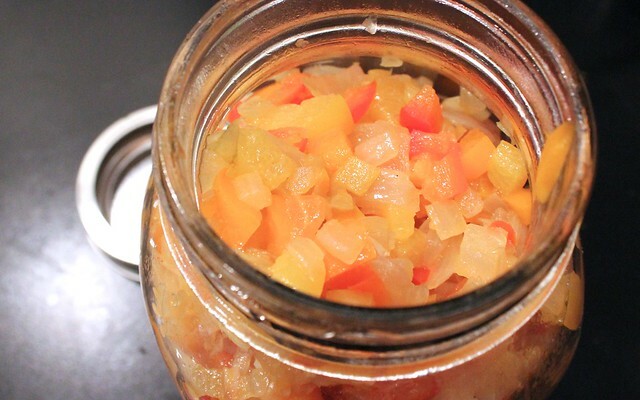 This entry was posted in Cuban, Gluten-Free, Salsas & Condiments, Vegan, Vegetarian and tagged condiments, cuban, recipe, sauce, sofrito, starter, traditional by Irina Gonzalez. Bookmark the permalink. can I use my cachucha peppers in my sofrito , with the bell peppers or just them? Yes, gayle, you definitely can! Just be careful because they have a different flavor and heatness level.